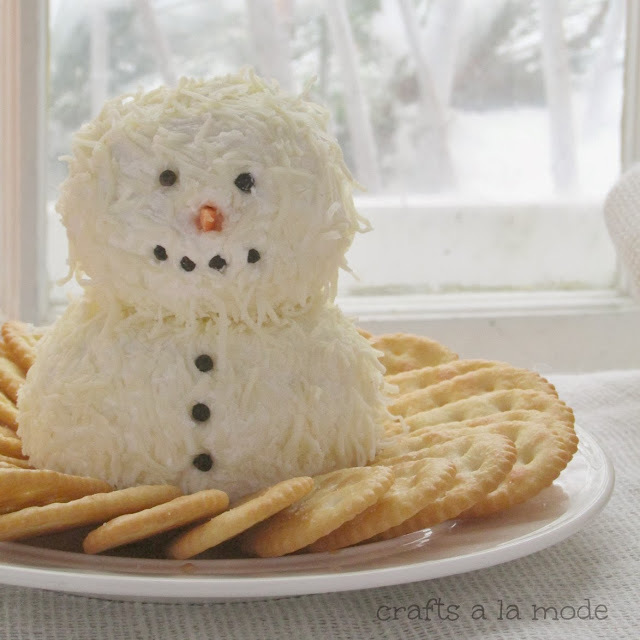 A snowman made from cream cheese and finely shredded mozzarella cheese!! Mix the garlic (if desired) into the cream cheese. Roll each ball in the finely shredded mozzarella cheese. Add peppercorns for eyes, mouth, and buttons. A little shred of carrot for the nose. Arrange on a plate with crackers, bagel chips, etc. He's pretty cute to bring to a party and pretty easy to make, too. Can you believe we got 3 inches of snow today? I hurried to make this before it was dark outside because I wanted to take pictures of the "snowman" in front of a window so you all could see our snow. See the twigs I painted to look like white birch branches? I put them in my front window boxes and did a post on them HERE. He's almost too cute to eat. Wouldn't he be a nice addition to YOUR party? And so easy to make. You could put whatever spices you want into this recipe, don't you think? 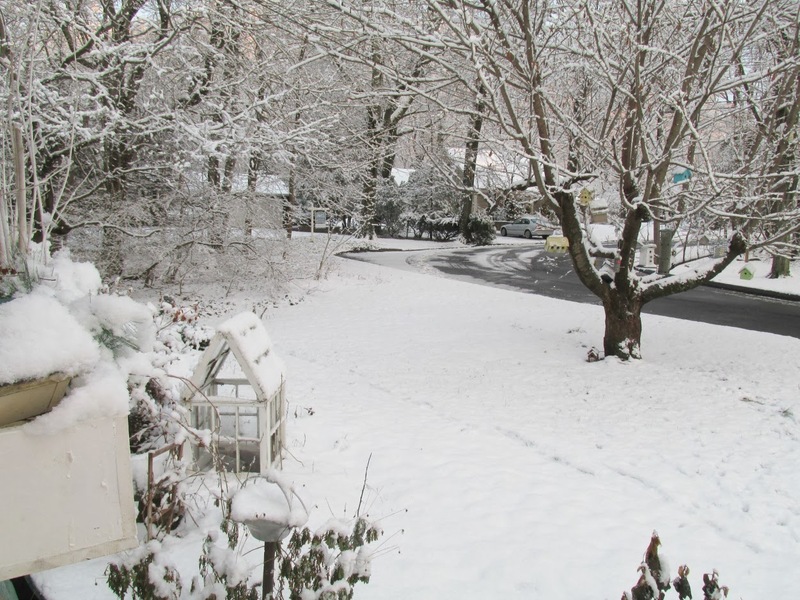 Here is a picture of the snow we got today. interesting stuff from all over the net! Just in time for Christmas. I'd love a white Christmas! Stop on by and see my Turkey Cheese Ball. Lots of fun for Thanksgiving, don't you think? 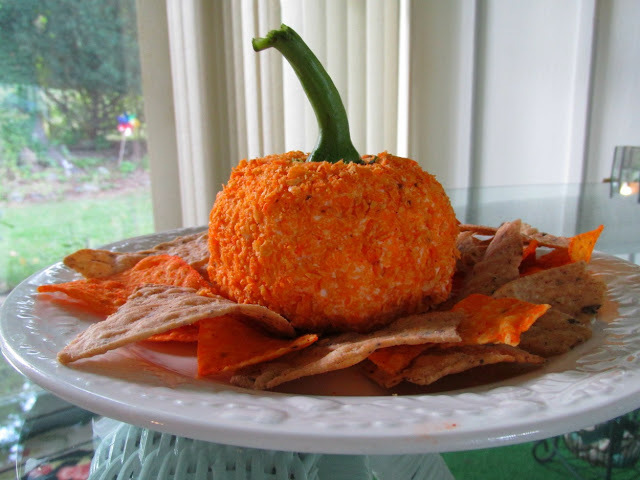 Here is another cheese ball that I serve in the Fall and winter. Very easy and basically the same recipe as for the snowman cheese ball. It makes huge fun at a party, also. Click on the picture to find out what I used for a stem. 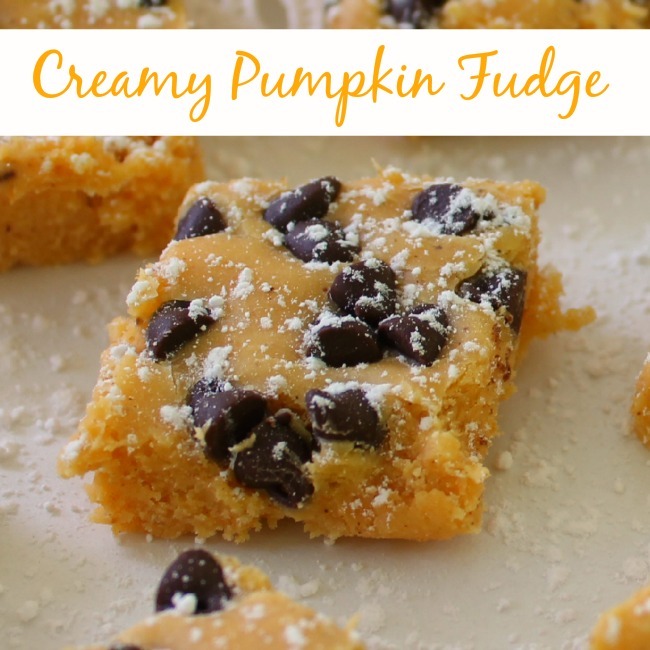 Pumpkin Fudge-this is so delicious. Easy, too (the recipes I like best are easy ones). 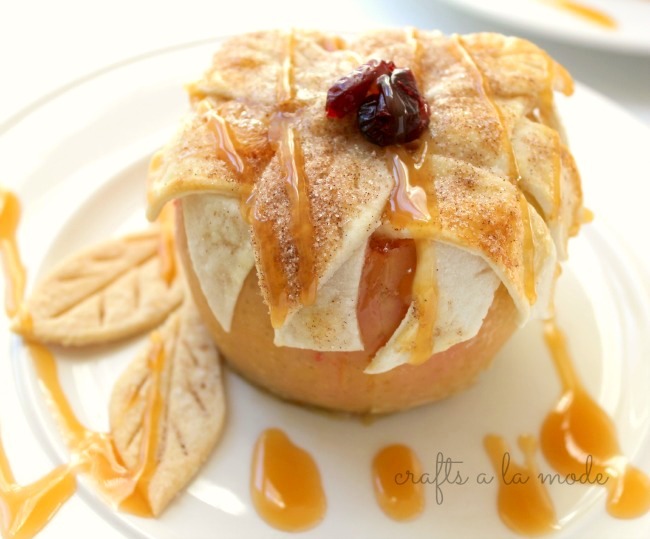 Cutest APPLE PIE baked in an APPLE!! 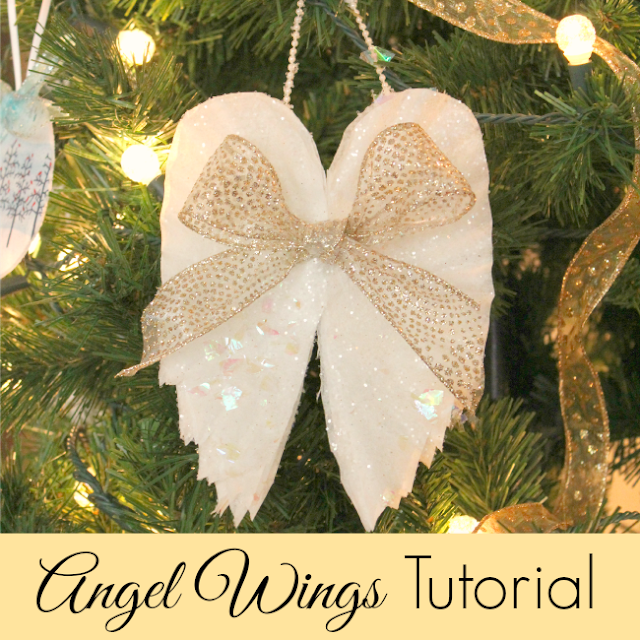 ANGEL WING ORNAMENT made out of COFFEE FILTERS! So happy that you came by to visit. I’m Linda. I am the chief cook-and-bottle-washer of this blog. I have a great big family that likes to do these things, too. You will get lots more like this if you subscribe to our newsletter. 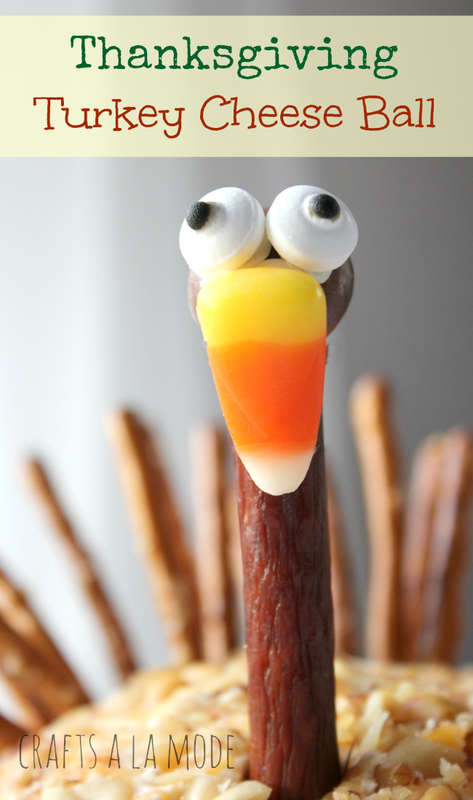 This is fantastic, as you say almost to cute to eat, but don't think it would last long in our family. I am trying to follow you as I love your blog, but can't get any of the buttons to work, could just be the bad South African internet, I don't know. 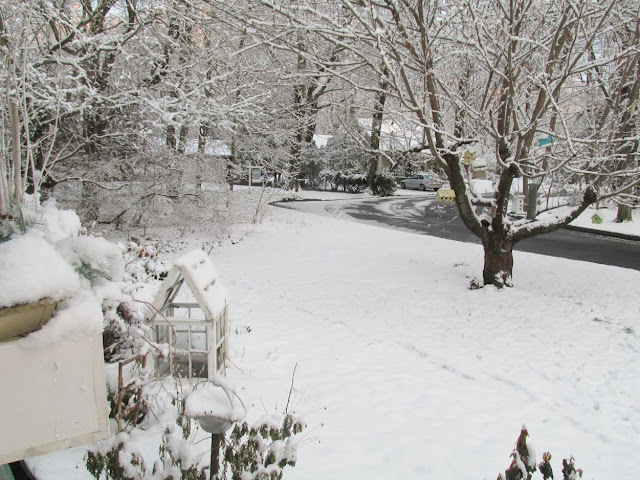 Wanted to add, lovely snow picture. We've had snow for a few weeks, finally the grass peeked through today though. Must be our internet, I am now following in allways possible except twitter couldn't get into twitter wil try again later. You bet I thought it was coconut. :) I actually like mozzarella better. How are you, Linda? Finally got around to setting up the page I wanted. It was quite the journey with a couple of ideas backfiring but I'm back. Cute and yummy! I'm not sure I could eat it since it's so adorable! Wait...it's cheese...I could eat it! Pinning! Thanks for sharing on the Daily Blog Boost today! Oh my he is so cute! And he looks delicious! Already pinned him….he is the cutest little thing I've ever seen! I will definitely make one for Christmas. Thanks so much for linking-up to My Happy List! Your little snowman surely made me happy!!! Oh, this is SO cute!!! Pinning to my Xmas board! This just could not BE any cuter!!!!! I just love that! So cute. Thanks for joining our Twirl and Take a Bow Party! Hope to see you again next week! Yup, I thought it was cocos. 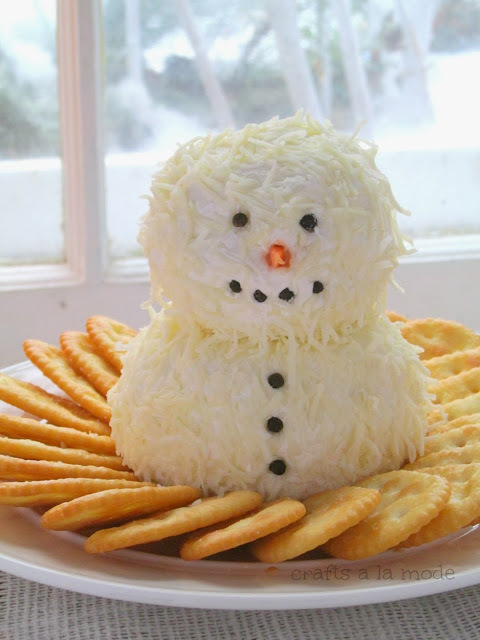 What a surprise to see a cheese snowman. Great idea, must try it one time. Thank you for sharing it at my 12 days party. I just featured this post on my blog! He is too cute to eat! Adorable! I saw this last night on Pinterest and was super-excited to see you linked up on Tasty Tuesday with us. I am one of the cohosts of Tasty Tuesday with Anyonita Nibbles. I am featuring this cute little guy on my hop tomorrow. Make sure you stop by and grab a "featured" button and link up again! I pinned this! I LOVE it! So cute! This is darling and will surely be on my table Christmas Eve! Lovely! You have been featured at Foodies & Crafties Soirée @www.kiddiefoodies.com! You may grab your button & hope to see you at the party tomorrow! This is great! I am making cheesecake next week and I am definitely making it a snowman. This has to be one of the cutest cheeseballs I've ever seen :) Just dropping by to let you know that we're featuring you at tonight's Freedom Fridays - grab a button if you'd like one! :) The party starts at 8:30 pm EST tonight! Hi Linda! 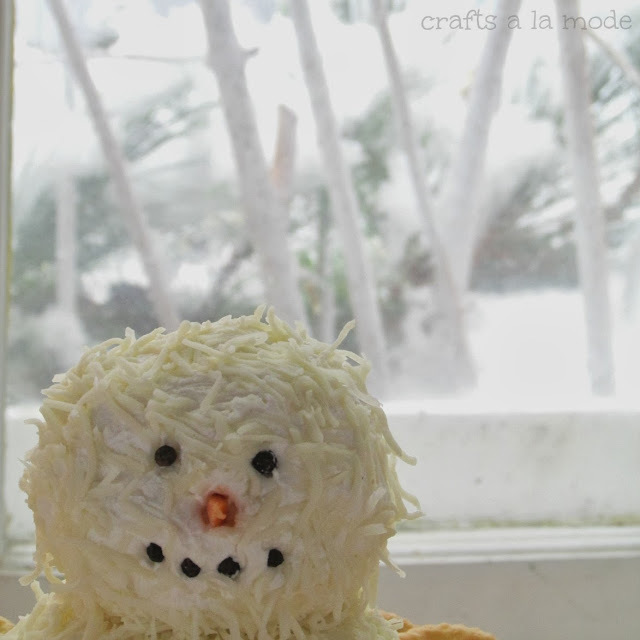 Thank you so much for sharing this cute and yummy looking cheeseball at last week's Get Crafty Friday party. Your post has been featured this week! I hope you will stop by and share with us again this week. Happy holidays! Such a great idea and it looks so yummy. We featured it in our Feature Friday post over at the Bowdabra Blog. Thanks so much for linking up! This is so cute Linda! Love it and it is so simple too! Sharing on my FB page. Stopping by from the Practically Functional party. What is his NOSE made out of? You did not mention it. What is his nose made out of? His NOSE is made out of a little tiny slice of a fresh carrot. Sorry about that. This is just ADORABLE, Linda! I can't get over it!! So glad you shared at Saturday Night Fever! 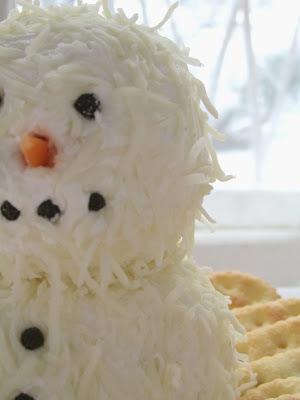 Snowmen are one of my favorite parts of the holidays so I am in love with this creation! So much happiness, thank you! That is absolutely so cute! I actually did think it was covered in shredded coconut until I started reading. You are very creative and did an awesome job with this. I love snowmen. I also have to agree that this looks too nice to eat!!! Cute idea! 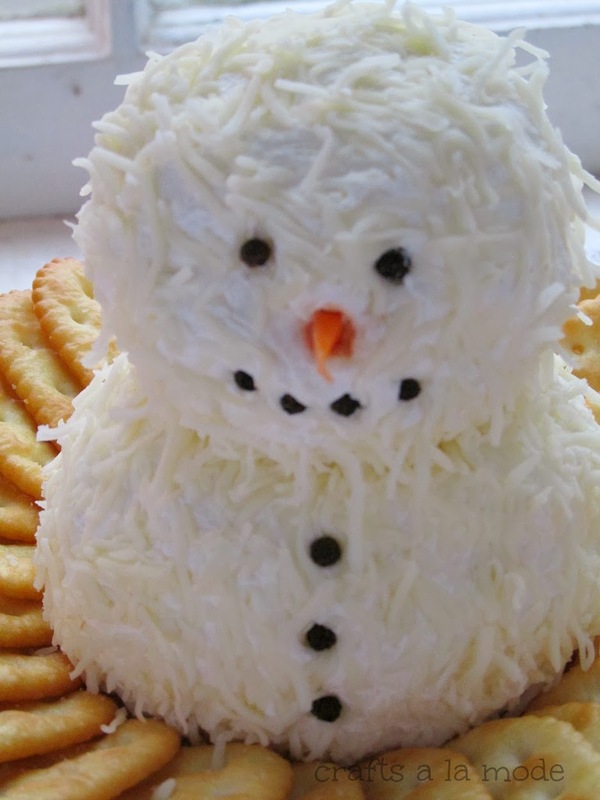 This looks great for a winter party snack...thanks for sharing!